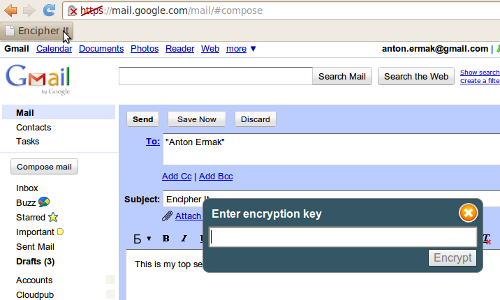 "Encipher It" One of the best and easiest AES Text encryptor for Google Mail or anything else. It Provide more secure PBKDF2 (Password-Based Key Derivation Function) key generation. It use Advanced Encryption Standard to protect your data. All encoding/decoding is performed locally in your browser. Subscribe "Network Nuts" You Tube Channel for More Linux Tutorials. Try "Encipher It" Now !